I sculpt, twist and manipulate sterling wire and add semi-precious stones, crystals, glass from the Czech Republic and sterling and gold fill beads to create each earring which are not the same for each pair. Each pair of earrings is unique just like us. People come in many shapes, colors and sizes. My jewelry designs have that same concept. We are all equal but we are not identical. 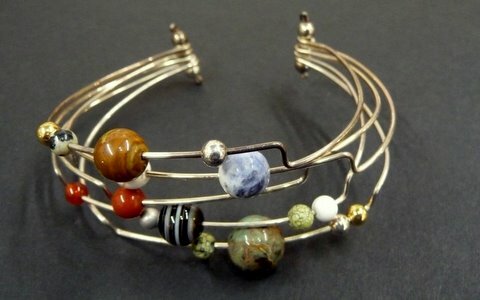 Balance is what I seek to create in my earrings, necklaces and bracelets. All my designs can be customized for each wearer. Colors, choice of stones and styles are created for you to enjoy and feel balanced as well. Pendants and bracelets can also be added if you like sets. Brain ran a successful florist and gift shop in New Jersey, just outside New York City for 22 years; using his creativeness to design floral arrangements for his customers. He now uses his talent to create beautiful one-of-a-kind pieces of jewelry. His business is called Balance by Brian.